Matthew 14:26-32 And when the disciples saw him walking on the sea, they were troubled, saying, It is a spirit; and they cried out for fear. But straightway Jesus spake unto them, saying, Be of good cheer; it is I; be not afraid. And Peter answered him and said, Lord, if it be thou, bid me come unto thee on the water. And he said, Come. 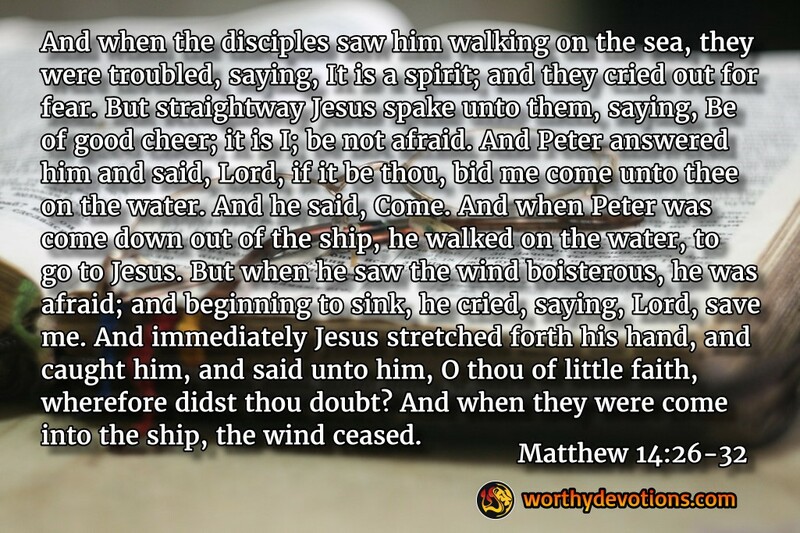 And when Peter was come down out of the ship, he walked on the water, to go to Jesus. But when he saw the wind boisterous, he was afraid; and beginning to sink, he cried, saying, Lord, save me. And immediately Jesus stretched forth his hand, and caught him, and said unto him, O thou of little faith, wherefore didst thou doubt? And when they were come into the ship, the wind ceased. We all know what Peter should have done, right? Keep his eyes on the Lord, NOT the waves!!! That's easy for us to say. But how many of us have ever stepped out of the boat? I didn't notice any of the other disciples playing follow the leader with Peter. I see two things from this: First, put a little adventure into your life; step out on the water; you might actually enjoy the exhilaration and really glorify God on the way. And secondly, If and when you do, learn from Peter's mistake. Make sure you live life keeping your focus on the Lord (not on your own spiritual ambitions)...because you can be totally confident the waves will come, once you're out of the boat. But watching the Lord of Life walking there with you will give you the vision to follow through. It was the will of God for the disciples to be in the ship and in the storm( Let thy will be done)knowing very well that Peter is always over zealous and quick to make mistakes(Let`s build a tent here one for Moses,......... fought for Jesus when He was being arrested and many other mistakes) I believe that this time He also made a mistake to ask Jesus to command him to step out of the ship and walk on water. Whose will was it? I believe by so doing he moved out of God `s will into his own. We might appear to succeed when we get out of God`s will but ultimately we will fail. Peter quickly realised that he was out of God`s will and quickly offered a short prayer which Jesus quickly answered and saved him.